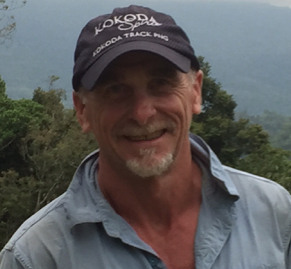 To date to many treks to remember over the Owen Stanley’s with Kokoda Spirit, Starting in 2008 after 18yrs as a professional lifeguard. Took time away from the track to complete my paramedic qualifications and as a senior medical response trainer delivering a variety of programs to mine rescue teams etc, throughout Australia and PNG. I am currently combining all these roles – never a dull moment in my working roster! Love all things outdoors………ski paddling, mountain biking, snowboarding, trail running, swimming, trekking, climbing, etc. My focus is the health and safety of my trekkers, porters and villages and ensuring that my trekkers have an empowering and life changing experience. Dip Paramedical Science, Cert IV WHS, Cert IV Training & Assessment, Cert IV Outdoor Recreation, Advanced Sports Strapping.